Supporters in Kinshasa of the opposition Union Pour la Démocratie et le Progrès Social party which did not participating in Sunday's elections. KINSHASA, 30 Jul 2006 (IRIN) - In the first democratic elections in the Democratic Republic of Congo (DRC) in more than 40 years, people started lining up early in the morning in many voting stations in Kinshasa and the east. "I voted for the first time in my life!" shouted one man with excitement as he left the voting station at the Roman Catholic school next to St Anne's Cathedral in the centre of Kinshasa. "Thanks be to God. Long live the Congo." Voters stood in long queues in the hot sun in various Kinshasa suburbs, including Lemba, Matete and Ngaba. Many expressed joy and pride at being able to choose their country's leaders. "After being colonised and oppressed we are finally the masters of our own destiny," Pierre Sungu, an elderly man waiting in the queue next to the cathedral, said. Voting was so heavy at the school that by 11:00 (14:00 GMT) ballot papers could not fit into the ballot box. The proceedings continued once an official had taken a stick and squashed the ballots into the voting boxes to make room for more papers. Voter turnout was also high 2,000 km east of Kinshasa. Long queues started forming in the early morning in and around Bukavu, the provincial capital of South Kivu. "I thought it was important to come early," Nanamie Bitendanwa, 30, said as she lined up at a voting station near the city centre. "We had been mistreated by yesterday's leaders. Now I hope we can choose more responsible people who will have to answer to us." Lines were also long at voting stations in Bunia, capital of Congo's troubled northeastern Ituri District. Voting was interrupted at one station in the suburb of Nyakasanza by a drunken policeman but the situation was otherwise calm. In rural areas around Bunia people faced more serious obstacles. A militia set up a roadblock at the village of Loribi, 20 km south of Bunia. IRIN talked to a group of 100 people who had walked 10 km to get to a voting station but the militia had forced them to turn back. "We are very disappointed," Joel Mandro, one of the would-be voters, said. In the western port town of Matadi, Bas-Congo Province, many people could not vote because their names were not on the voter registration list. The Independent Electoral Commission had said that at least 1.2 million of the 25.7 million names on the voter list had gone missing but that the index numbers on their voter cards could still be used as identification. Even so, officials at the polling stations turned them away. 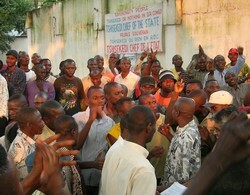 Similar problems were being reported in the towns of Tshikapa, in Kasia Occidental Province, and in Kinshasa. The head of the electoral commission, Apollinaire Malumalu, said at a news conference in Kinshasa on Sunday that some people in the town of Gemena, Equateur Province, were trying to vote by force in stations where they were not registered. "They have to realise that they can only vote were they are registered," he said. Malumalu also said he had heard that people in Kinshasa and Kalima, in Maniema Province, were paying people to vote for their party. Two people at the news conference said they had seen a representative from President Joseph Kabila's party paying voters. Afterwards a representative from the party denied the accusation. There appeared to be low turn-out in the capital of Kasia Occidental, Mbuji Mayi, the stronghold of long-time opposition leader Étienne Tshisekedi, who, along with his party, the Union pour la démocratie et le progrès social (UDPS), did not participate in the elections. "The only way we can have a voice is to stay away from the polls," a Tshisekedi supporter said. Tshisekedi had called for a boycott, then decided to run, but by then the electoral commission had said it was too late. On Saturday in Mbuji Mayi a Molotov cocktail was thrown at a truck full of electoral material. The truck caught fire and exploded. The vice-president of the electoral commission, Norbert Basengez, said on Saturday that the truck only contained voting booths and kits, not actual ballots. "The incident will not disrupt the voting," he had said. Three of the vice-presidents in the current transitional government, who were former rebel leaders, boycotted a meeting on Saturday with the head of the commission to protest at the shooting of bodyguards of one vice-president, Azarias Rubewa, by President Kabila's guards. However, in a joint news conference, the vice-presidents said people should still vote. "We ask all citizens to vote even though there are security concerns and many technical problems with the elections," Arthur Z'ahidi Ngoma, one of the four vice-presidents in the outgoing transitional government, said. With 25.7 million registered voters, UN officials say this is the largest election it has supported and logistically the most difficult. "There are almost no roads in this country," said Michel Bonardeux, a spokesman for the UN peacekeeping mission in DRC, MONUC. "Hundreds of tonnes of election material had to be sent by air." The logistical challenges mean results will take time. "We have promised the results for the presidential elections will take no longer than three weeks," Malumalu said on Saturday. "Partial results for the parliament could come in sooner.